Meet your Dream It. Do It. Career Dream Team. Plan to attend the next Tri-State Manufacturers’ Association meeting to learn about Dream It. Do It Minnesota and the new Manufacturing Career Dream Team. These up and coming talented manufacturing employees are available to speak to schools, classes, and community groups throughout the West Central region, sharing information about manufacturing careers. Learn how this effort is supporting workforce development in the region. 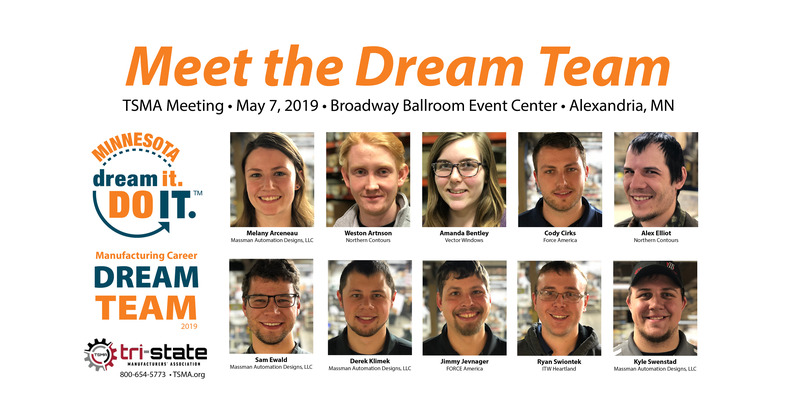 Meet Career Dream Team members, learn why they wanted to become part of the Dream Team, and hear about their experiences in the program so far. Pope/Douglas Solid Waste Management (PDSWM) operates a fully integrated solid waste, recycling, pollution prevention and outreach/education system. PDSWM operates a Materials Recycling Facility (MRF). The facility is was added in 2003 for the purpose of removing some recyclables, hazardous and problem items from the delivered trash prior to being incinerated at the Waste to Energy (WTE) Facility. The MRF runs two shifts Monday-Friday and occasional Saturday to efficiently pre-process the wastes that are delivered via waste haulers. PDSWM operates a Waste to Energy Facility (WTE). The facility was constructed in 1986 and began accepting waste in April of 1987. In 2011 a third combustion unit was added to the WTE Facility to meet the solid waste management needs of Pope and Douglas Counties. The Waste to Energy facility is permitted to process 240 tons per day. It operates 24 hours per day, 365 days a year. The facility has a pit that is 20 feet deep where the industrial wastes and sorted wastes from the sorting facility are mixed together. A grapple picks up the waste and loads it into the incinerator where it is burned at 1,800F. During the incineration process 76,000 M pounds of steam, at 170 pounds of pressure, is generated. -No high heels, flips flops, or open toed shoes. -Enter through the Residential Entrance and park where available. Parking is tight so additional parking is available on the road-Jefferson Street.